Able2Extract PDF Converter for smartphones and tablets is a lightweight mobile PDF solution that provides accurate and high quality conversions on the go. Easily create and convert PDF files to and from editable Microsoft Office documents right from your iOS phone in just two simple taps, and for free! All you need to do is locate any file on your iOS device and select to open it using Able2Extract PDF to Word. Once the file is imported into the app, all you have to do is tap on the conversion symbol and then select your conversion output. We’ve made the mobile user experience a top priority. 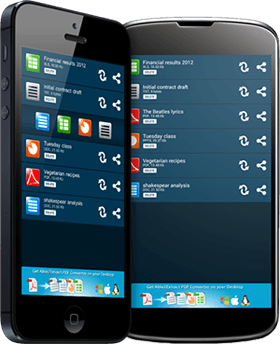 Able2Extract PDF Converter for smartphones and tablets is resource efficient and allocates only a minimum amount of your device’s processor and RAM resources to the entire PDF conversion and creation process. Your files are sent to our powerful servers where our best-on-market conversion technology is able to convert your files. Once the process is done, high quality conversion results are then quickly sent back to you without any loss to your Android device’s performance. For your privacy, files are never stored on our servers for more than 24 hours, and are never used for anything else other than for the conversion process. For instant pdf2doc conversions, download able2doc mobile. For instant creation of high quality PDFs from your Office documents, download PDF Creator Mobile. For more conversion output formats and customized conversions, including pictures, Libre Office and AutoCAD, try the Able2Extract PDF Converter Desktop version.